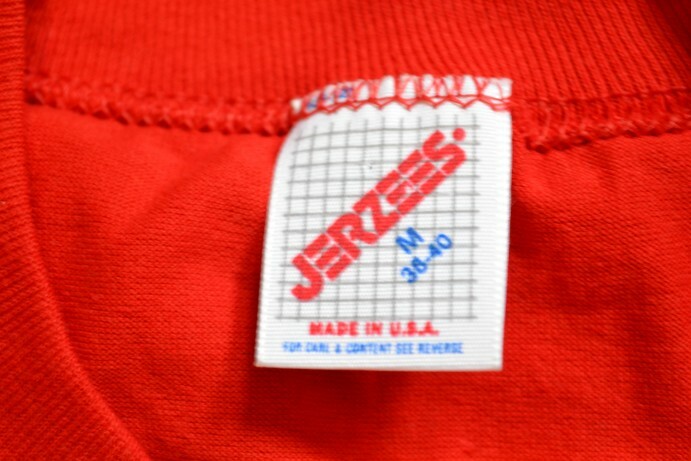 We ship a lot of vintage t-shirts every month. If you want to get some in the mail, subscribe to Comma, Vintage today. 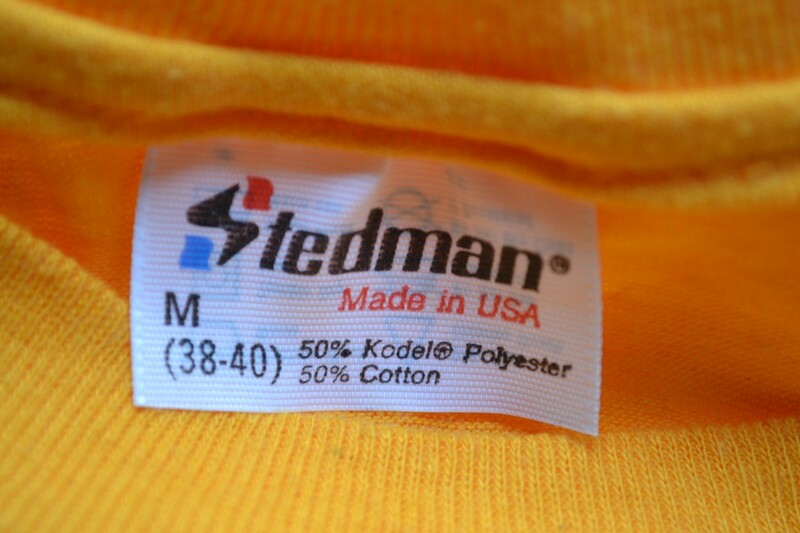 50/50 or FIFTY-FIFTY: This describes t-shirts made from a blend of equal parts cotton and polyester. They’re not uncommon—I find 50/50 t-shirts more commonly than 100% cotton ones–but it’s often used in listings and so worth knowing. 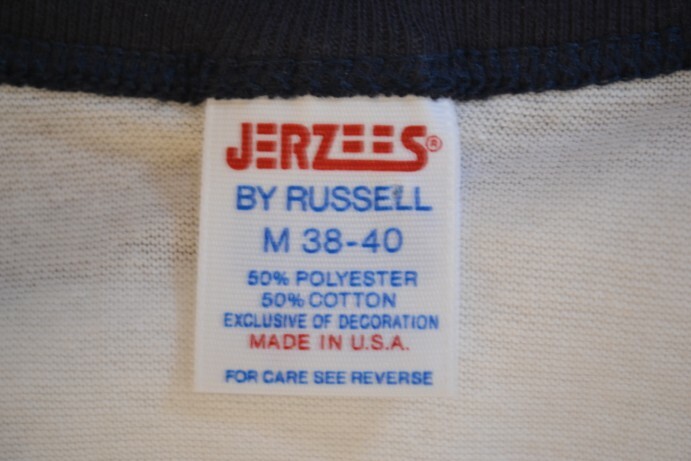 Tag on a 50-50 vintage t-shirt. Note the Futura all-caps. 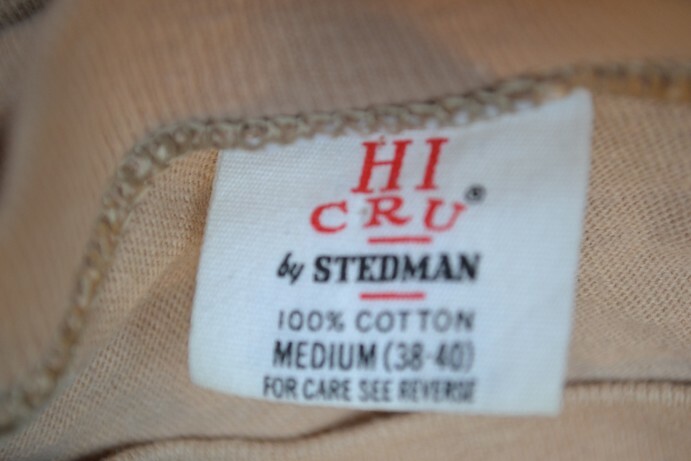 Tag on a 50-50 vintage Stedman t-shirt. 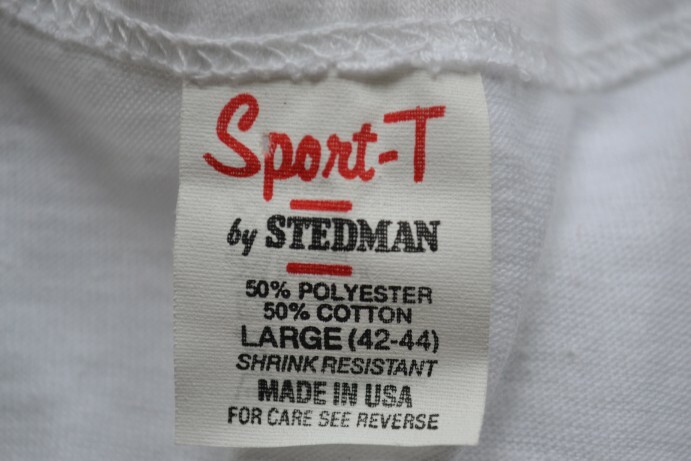 DEADSTOCK: Deadstock refers to a t-shirt in new and unworn condition. 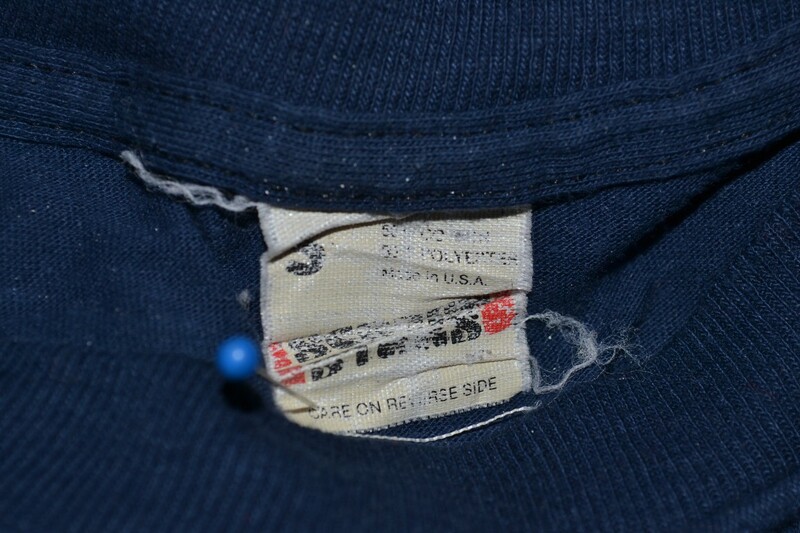 Among vintage items, deadstock t-shirts are relatively common. Chances are they sat untouched in a screen-printers inventory for decades before being donated or sold. Smooth seams: On a shirt that has been washed, the seams will often cinch up, creating a bit of a ripple at the hem, neck, and shoulders. 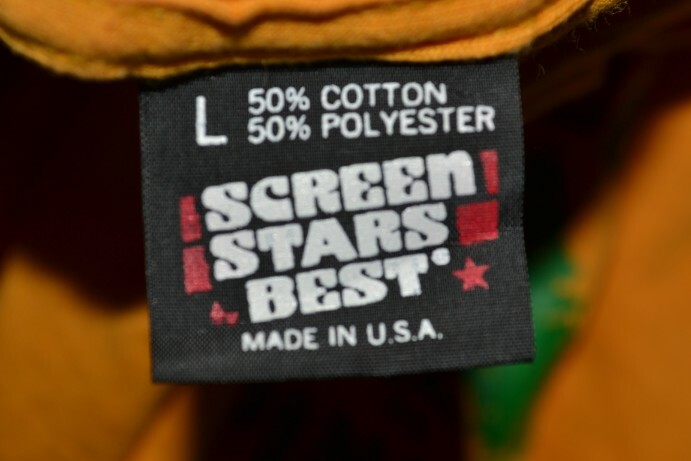 Crisp tag: The tags on many vintage t-shirts are made of a stiff, papery material. These tags degrade quickly after washing. 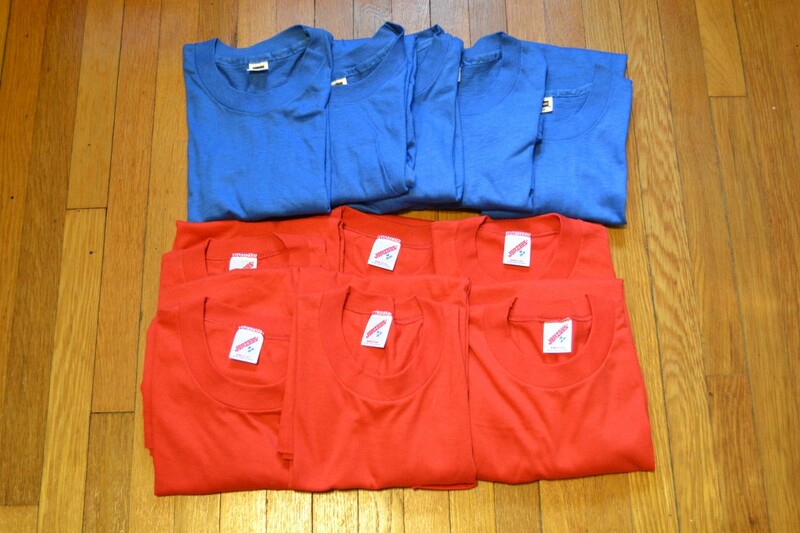 Found in bulk: If you find 7 or 70 identical t-shirts together, it’s likely that they’re unworn. Printers often liquidate inventory in lots rather than as individual pieces. 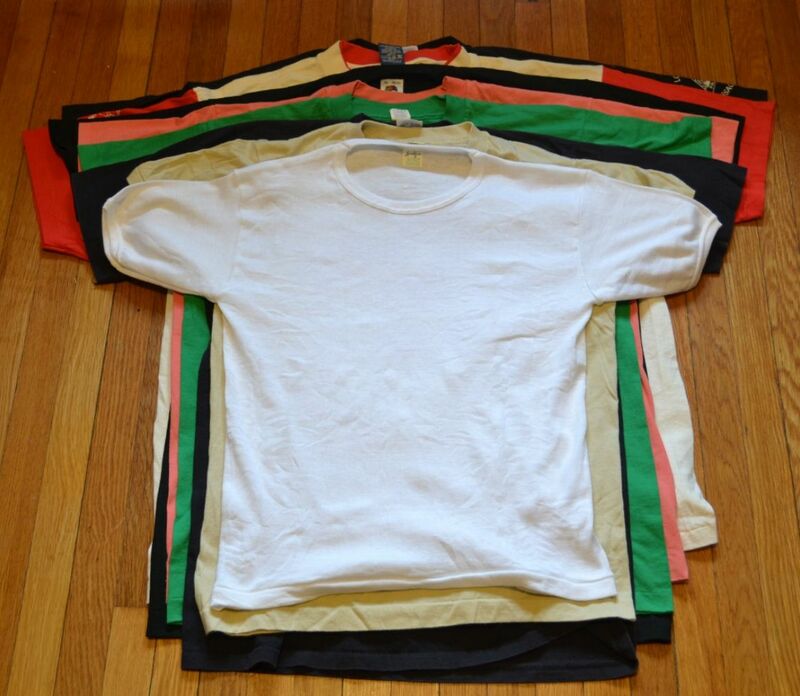 These blank t-shirts were all found together in a single lot. Though they lack tags or packaging, I feel confident claiming they’re deadstock. I cannot, however, prove this conclusively. Use of the term “deadstock” seems to me a bit more lenient in vintage t-shirt sales than in jeans or sneakers. I endorse use of the term so long as condition is reasonably deduced. It’s a different calculus than with Jordans or Levi’s, of course: Many deadstock t-shirts are being sold for daily wear and can be had for less than $20. IRON-ON HEAT TRANSFER: An iron-on graphic is exactly what it sounds like: An image or text transferred to the fabric using heat. They are subject to peeling and cracking, and don’t hold up well to numerous washes. On the flip side, they often feature photographs and detail difficult to otherwise put on a t-shirt. 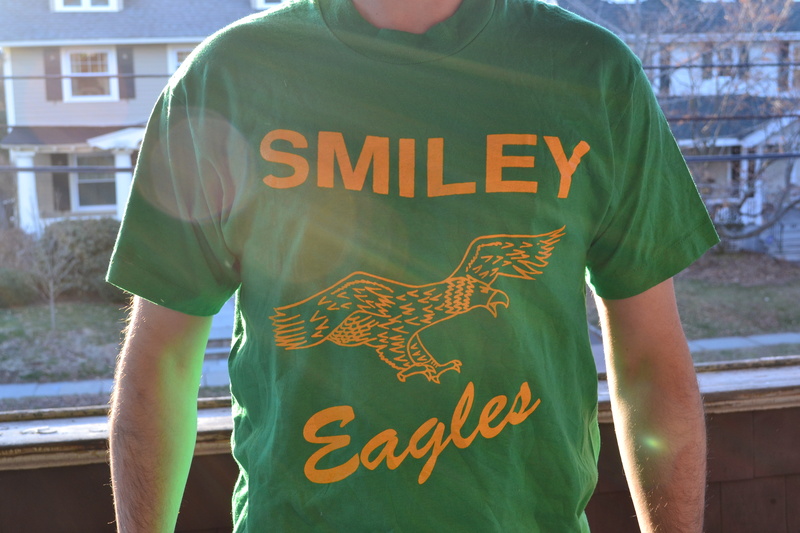 And vintage iron-on graphics can be bought unused and newly applied to any t-shirt you please. 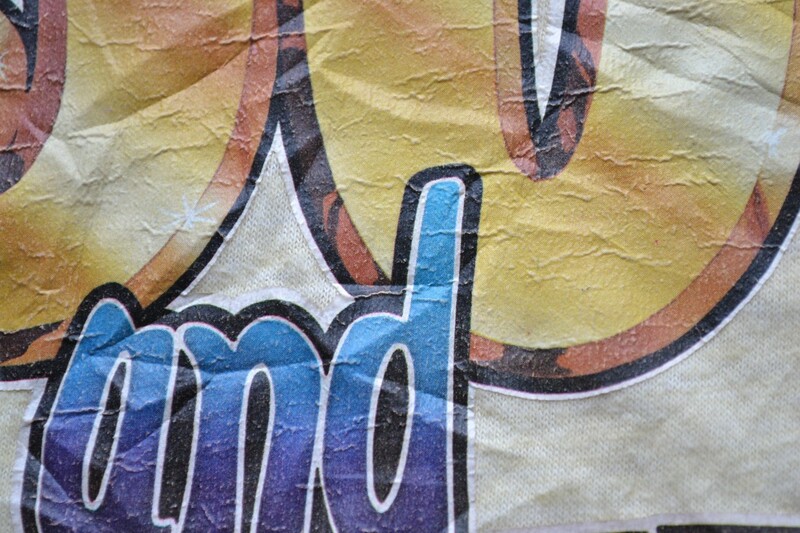 Iron-on Heat Transfers allow for more color and detail, but the image is prone to wrinkles and cracking. 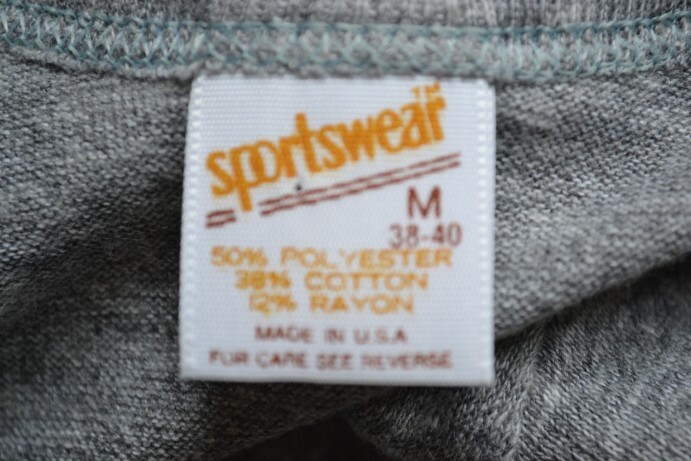 Vintage iron-on graphic, dated 1980. The wearer looks good for 50. 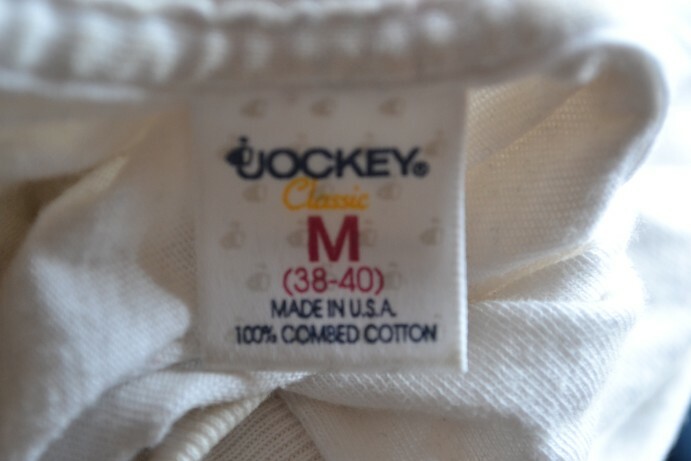 MOUNTED COLLAR: A mounted collar is sewn onto the top of the t-shirt, rather than sewn under the fabric. In my experience, mounted collars hold their shape better than sewn-under ones. Note how the edge of the collar is sewn over the body of the fabric. Here the collar is sewn under the fabric. 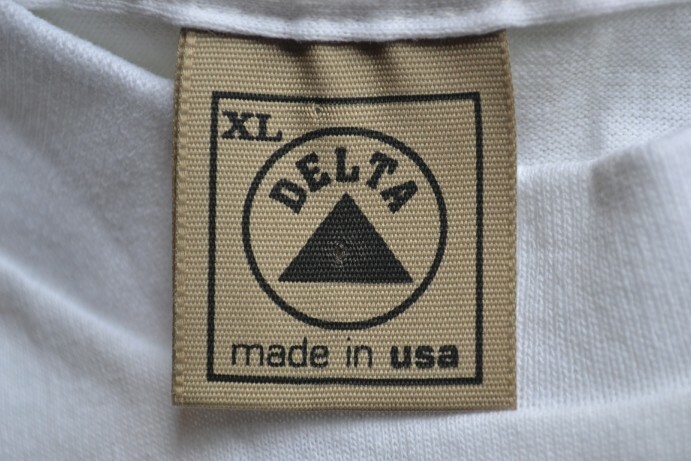 An older vintage t-shirt–from the 1960s, for example–is more likely to have a mounted collar than one from the 1980s or 1990s. So, do a double check if you see one in the wild. Of course, Russell Athletic still mounts collars in 2018. PAPER THIN: This term is used to describe t-shirts that are particularly well-worn and soft. 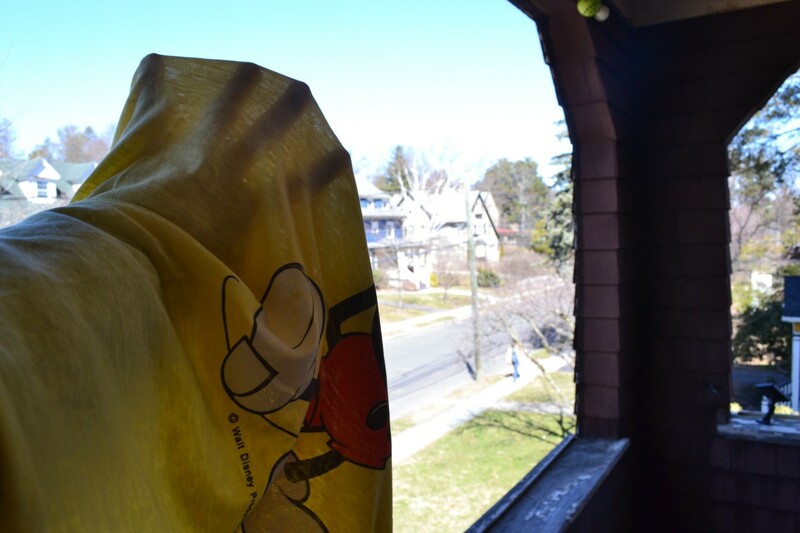 A common practice of proof is hold the shirt up to a light. I tried my best below, though there are much thinner shirts in the world. 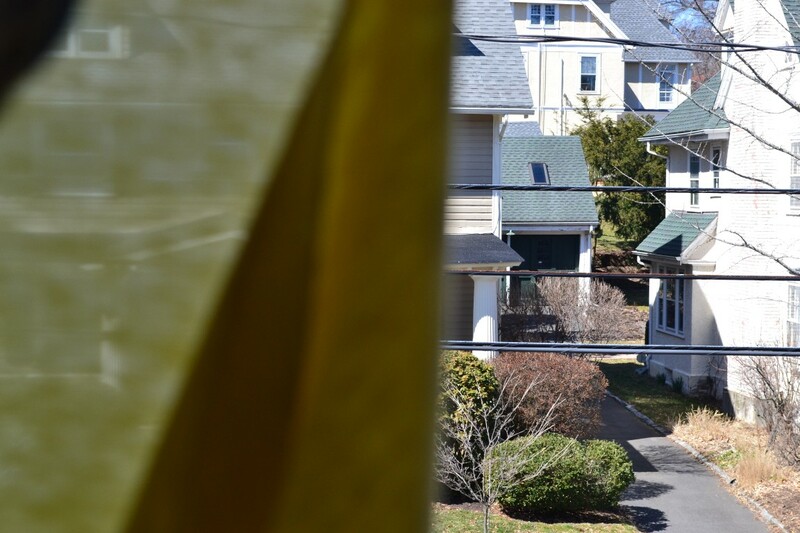 If you look closely, you can see architectural details through the fabric. 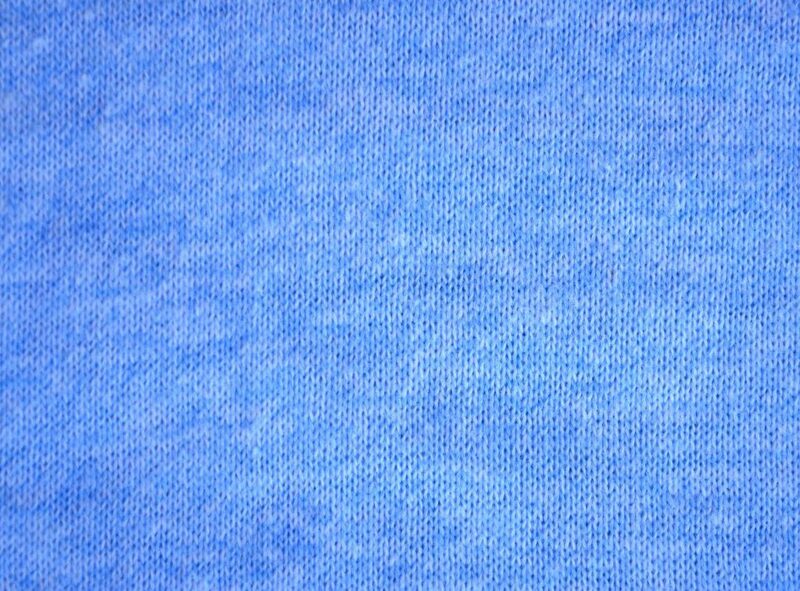 Showing a hand through a paper-thin t-shirt is a popular photograph. So, here is mine. RINGER: A ringer has different colored collar and cuffs made from a ribbed material. They offer a distinctively vintage look. Vintage ringer t-shirts hug the biceps more than a standard cuff. Here the graphics, collar, and cuff are the same color, giving a sense of cohesion to the piece. 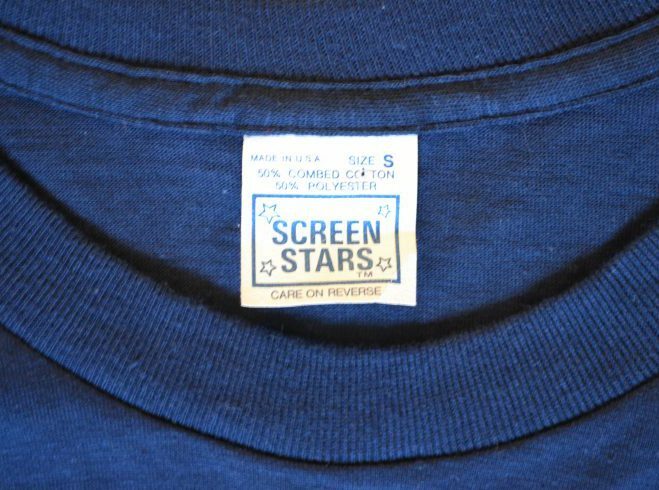 SCREEN PRINTED: In screen printing, an inky medium is pressed through a screen and onto the t-shirt. Because the process requires a moderately laborious set up, many vintage screen printed t-shirts–especially those from small events or local institutions–feature only one or two colors. 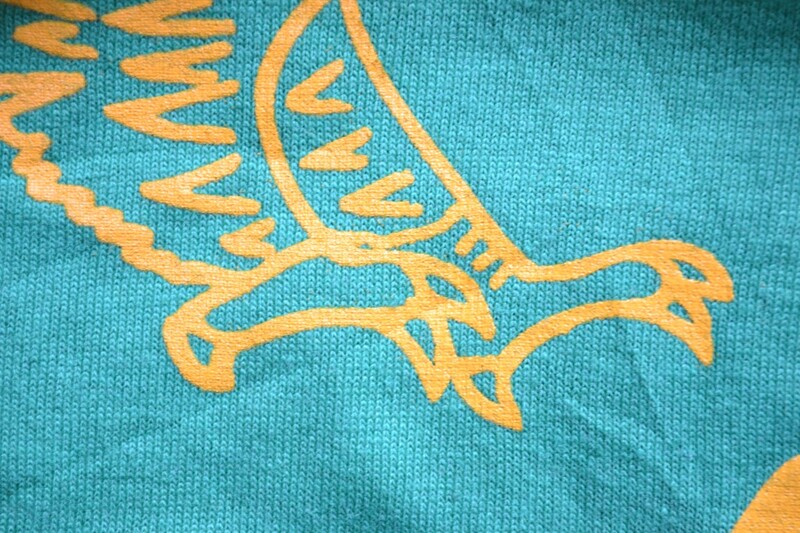 In screen printing, the ink is applied onto the fabric through a stencil. Schools, bands, and events often screen printed in only one color. “SELVAGE POCKET:” Many sellers erroneously use this term to describe the reinforcement tape used within the pockets of many vintage t-shirts. The fabric is not selvage in the least. But-shirts with reinforced pockets tend to be of good age and quality, so it’s useful term to know. 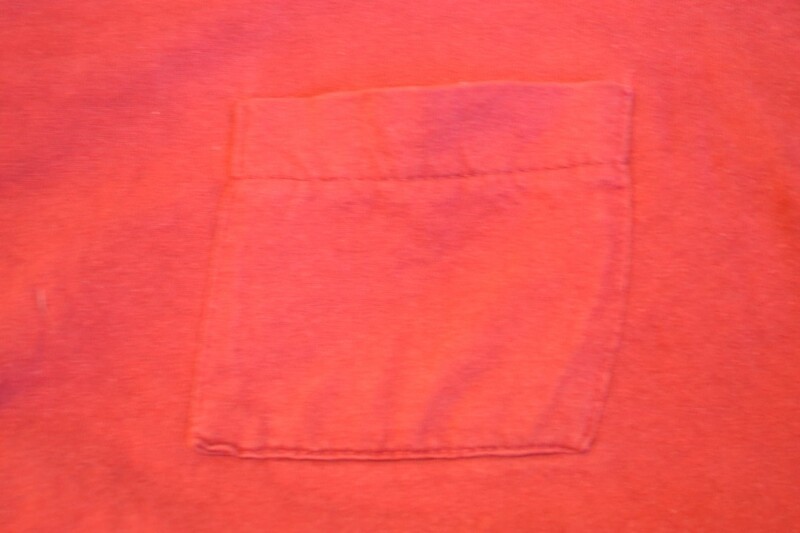 This is the exterior of the pocket. Note the single row of stitching beneath the opening. Inside the pocket, the reinforcement tape is visible. This is sometimes erroneously called selvage. 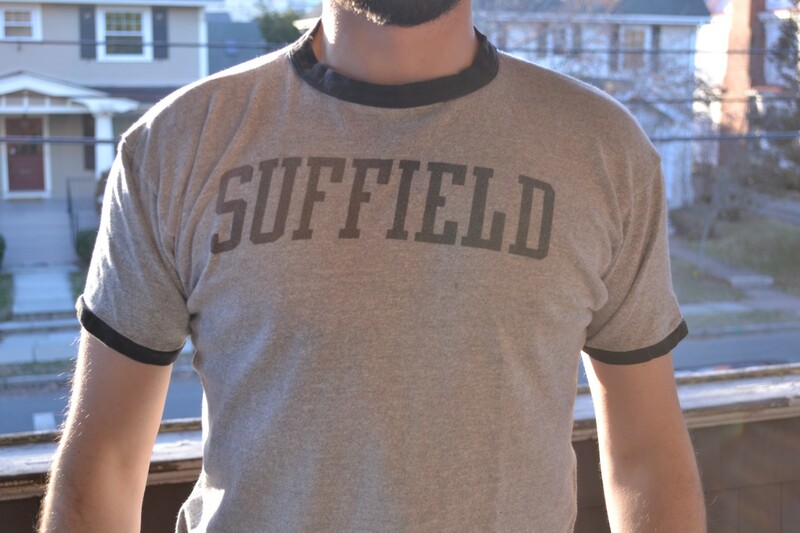 SINGLE STITCH: Single stitch refers to the prevalent mode of construction in vintage t-shirts. Specifically, it refers to the finishing on the cuff, hem, and shoulder of the t-shirt, where a single line of stitching secures the fabric edge. 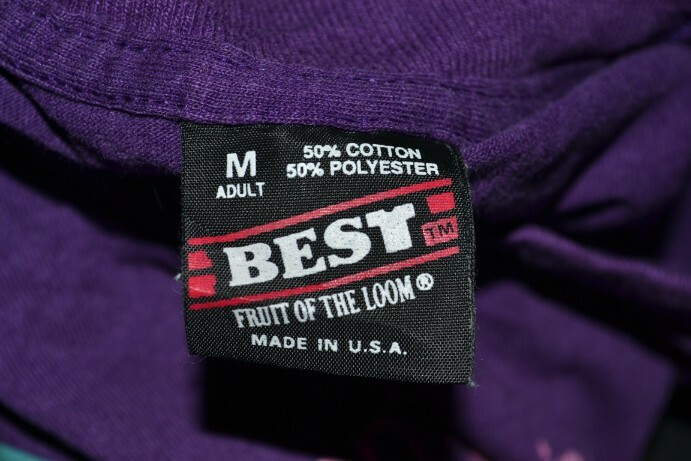 On most contemporary t-shirts–your standard Gildan, for example–a double row of stitching is used. Close up of shoulder seams. When thrifting, you might scan the t-shirt rack cuff by cuff rather than flipping through every single hanger. It’s a time saver. 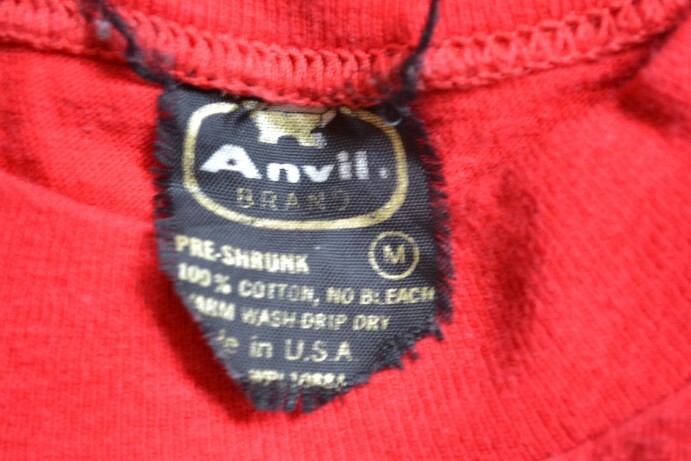 Of course, not every interesting vintage t-shirt is single stitch, and not every single stitch t-shirt is truly vintage. A number of brands use single stitch construction to replicate the vintage look. 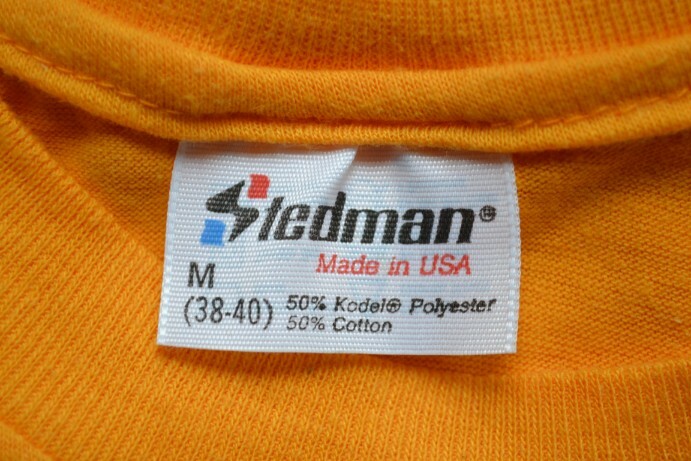 And many vintage shirts, especially those from the 90s, may not be single stitched throughout. 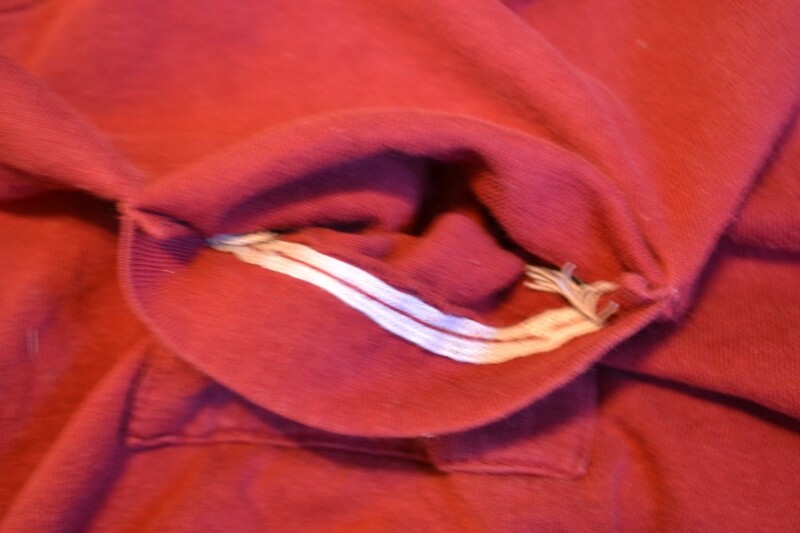 Generally, the damage is from frequent washing and wear: Discolored collars, holes at the shoulders, and frayed hems are common. Natural fading and repairs are often desired. A giant wine stain on the front does not contribute to thrashiness. TRI-BLEND: Tri-blend refers to vintage t-shirts made from from cotton, polyester, and rayon fabric. 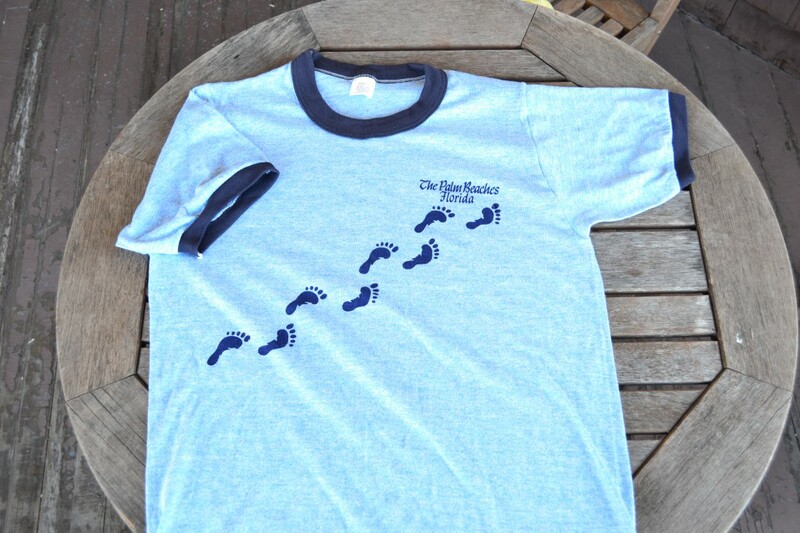 These t-shirts are desirable for their rarity, softness and durability. The yarns are often heathered, giving the fabric a unique, variegated look. 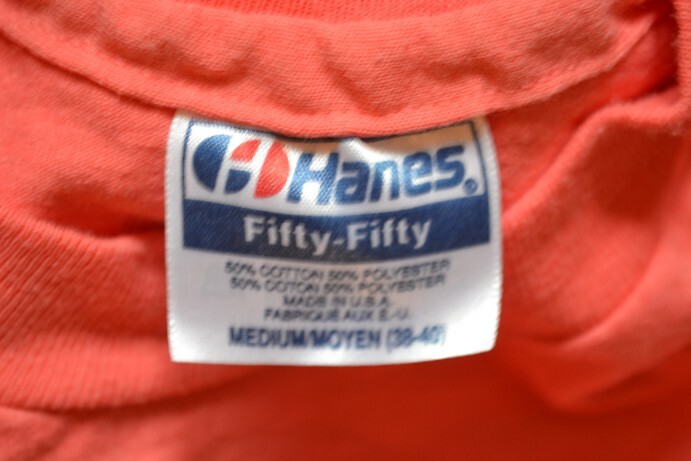 Vintage tri-blend t-shirts feature a blend of cotton, polyester, and rayon. Heathering creates variations of light and dark color within a fabric. TUBULAR KNIT (OR, CIRCULAR KNIT): Circular knit t-shirts are made from fabric knit into a tube shape. As a result, t-shirts made with circular knit fabric lack side seams. In my experience, tubular knit t-shirts drape more fluidly and more naturally than shirts with side seams. On a vintage tubular knit t-shirt, the fabric forms a complete cylinder around the torso. On many new and vintage t-shirts, two panels of fabric are joined with side seams. Please note that circular knit does not mean loop-wheeled. It’s a bit of a frog and toad scenario: Loop wheeled fabrics are made on a particular kind of vintage circular knitting machine. You can read more about loopwheeled fabrics at Heddel’s, though understand that circular knitting is still done on an industrial scale in 2018. 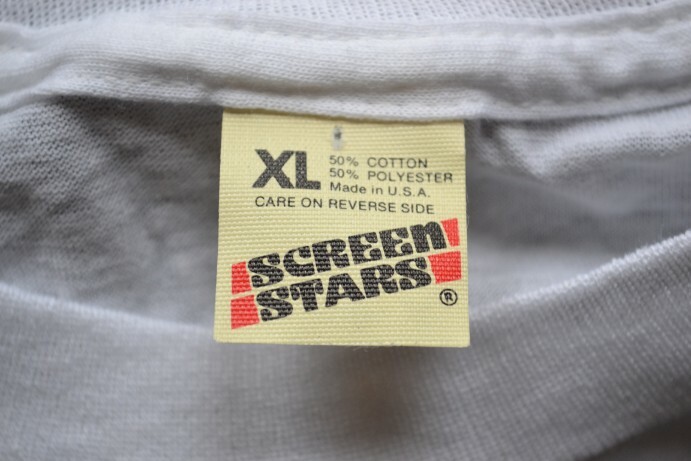 There are, to be certain, dozens of vintage t-shirt brands. But some are more common than others. Below is a catalog of comma tags I’ve come across, as well as approximate dates of production. 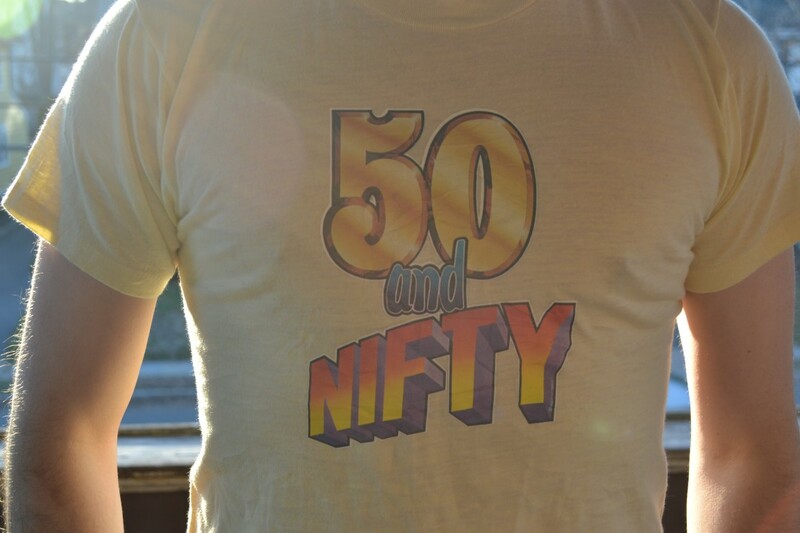 The only certain way to date a vintage t-shirt is to have a date attached to the graphic. 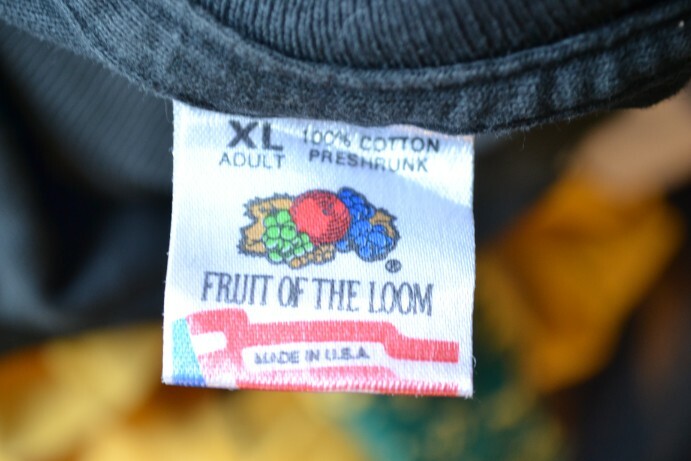 When we find multiple t-shirts with the same tag but different printed dates, we can reasonably estimate a range of production for all shirts with that tag. 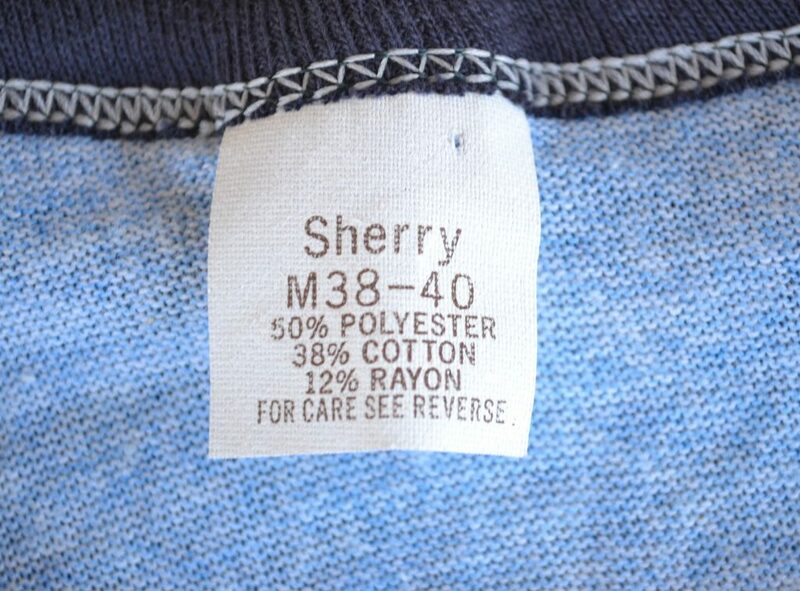 So, if we find a shirt with a given tag but no visible date, we can roughly determine its age. 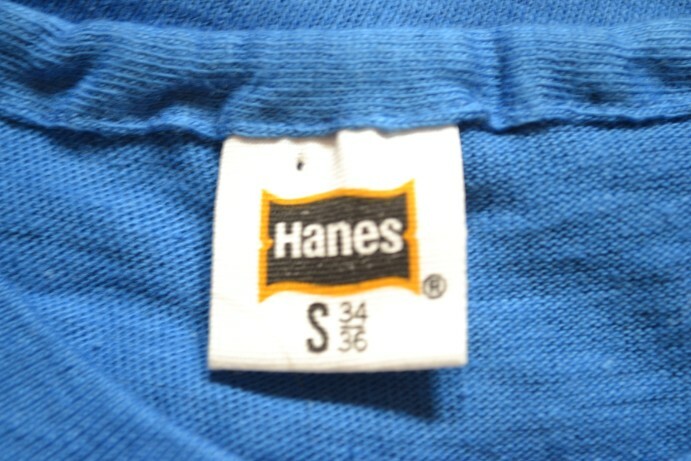 The shape in this vintage Hanes t-shirt tag appears in many colors. 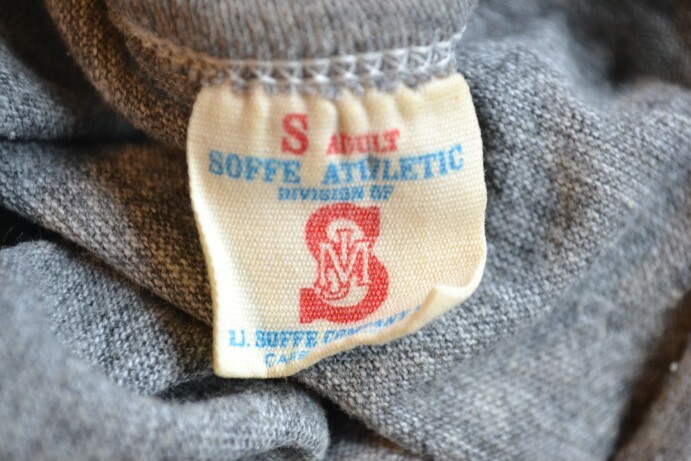 This tag can be found on shirts from the late 1970s as well. 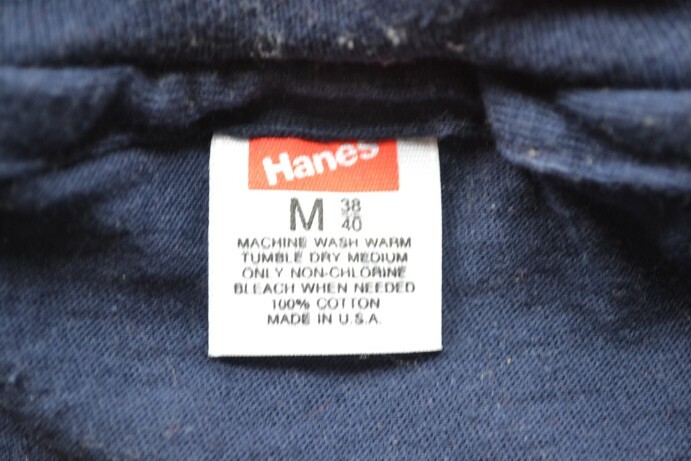 In my opinion, the Hanes 50-50 tag is way ahead of its time. 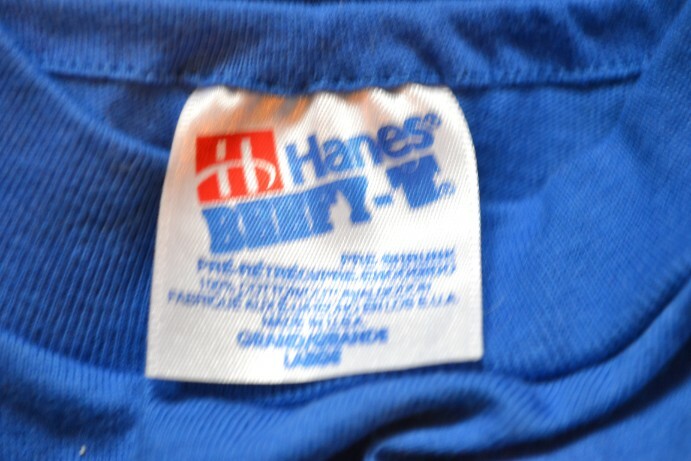 Hanes gets rectangular in the 1980s. 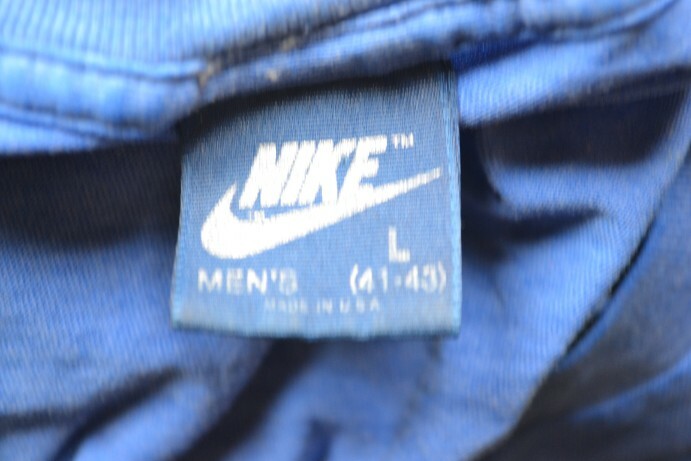 Nike Blue tag from the 1980s. 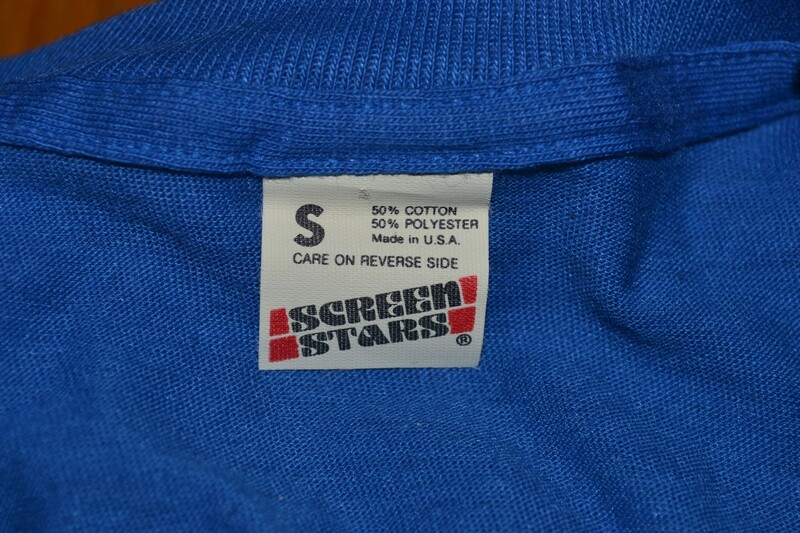 The 1990s Screen Stars tag was the inspiration for the cover of the “Rap Tees” book. 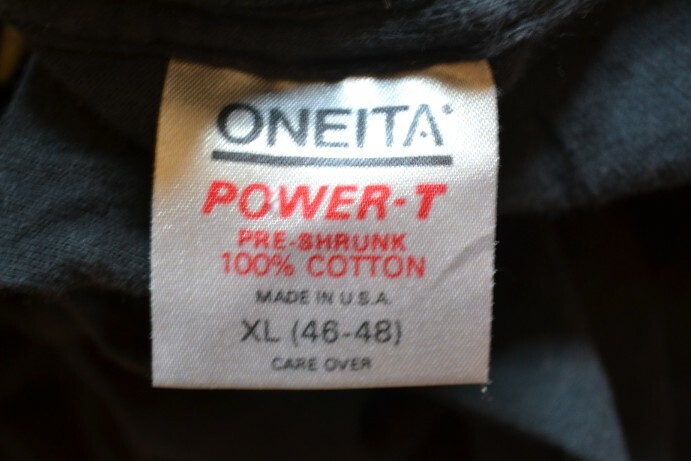 The Oneita Power-T is a bit heavier than most t-shirts. Cotton Exchange T-shirts feature a heavy, almost terry-cloth style fabric. This list is not exhaustive, nor do I insist on precision. I hope to add to it over time. 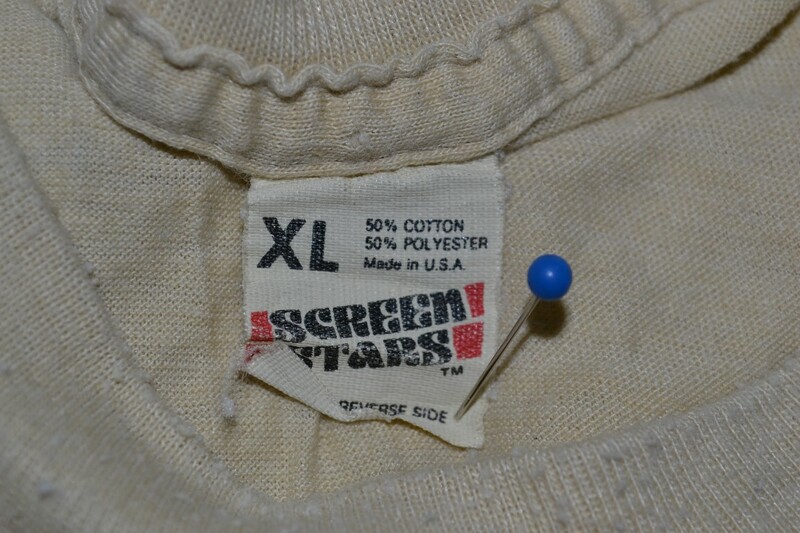 When looking for vintage t-shirts, the size on the tag is, for the most part, arbitrary. 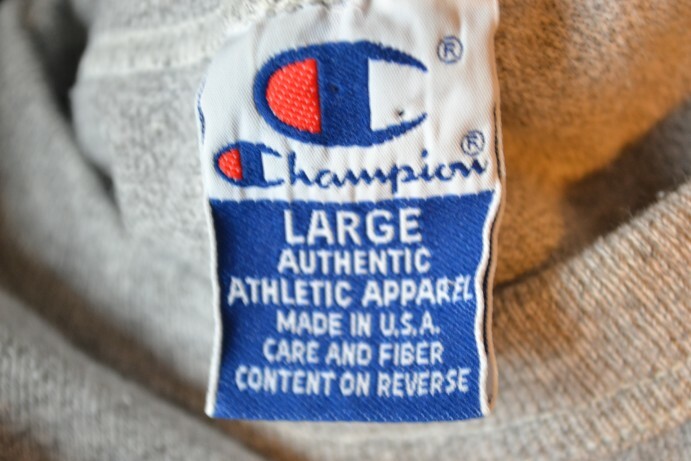 I wear a small in 90% of contemporary brands. My personal vintage t-shirt collection ranges from small to extra large, and they all fit about the same. The photo on the left shows shirts tagged “Extra Large.” Note how they vary in width. The photo on the right shows shirts tagged “Large.” Note how they vary in length. All of these shirts are tagged “Extra Large.” As you can see, they vary widely in width. All these shirts are tagged “Large.” They vary a great deal in length and width. 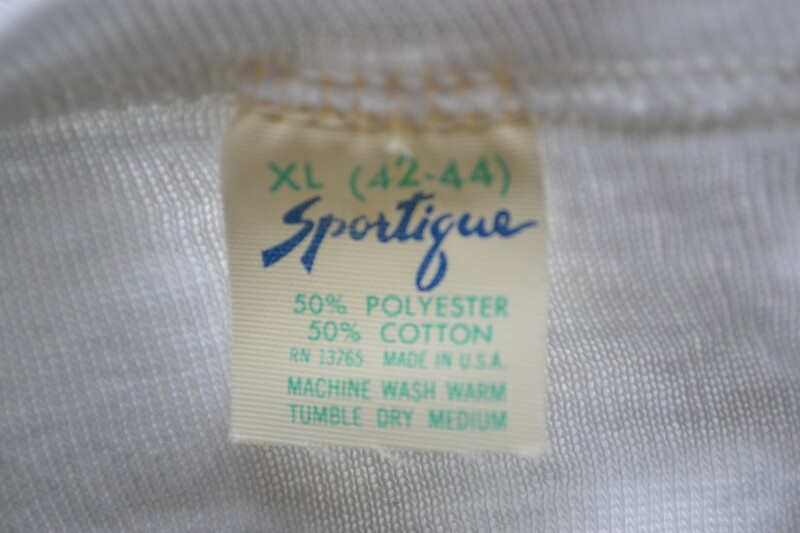 Generally speaking, the size of a shirt relative to its tagged size has increased over time. That is to say, a large from 1995 will be bigger than a large from 1975. There’s plenty of anthropological explanations for this, but I’m not qualified to investigate them. It’s more important to understand shrinkage. 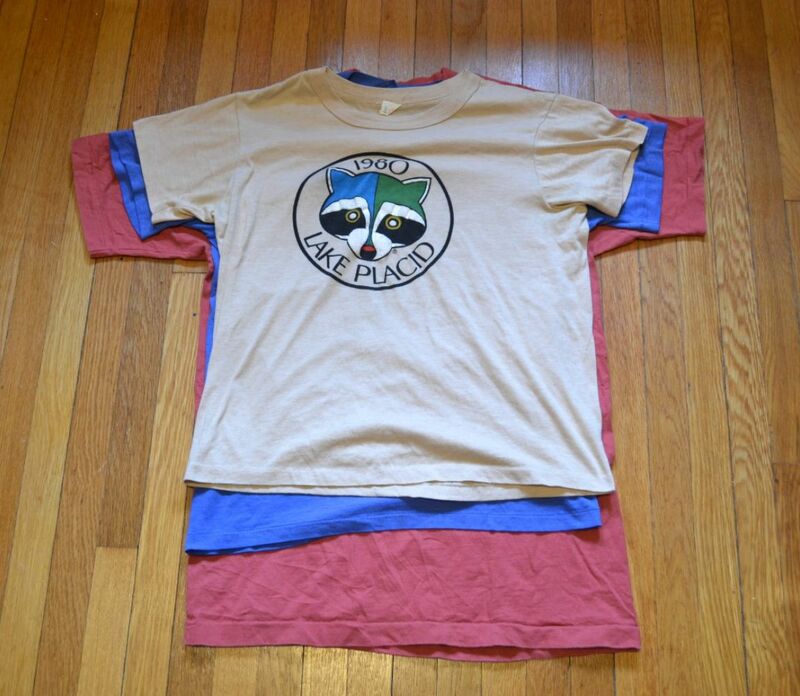 If you find a vintage t-shirt in deadstock condition, prepare for it to shrink considerably. 100% cotton t-shirts will shrink more than polyester blends. 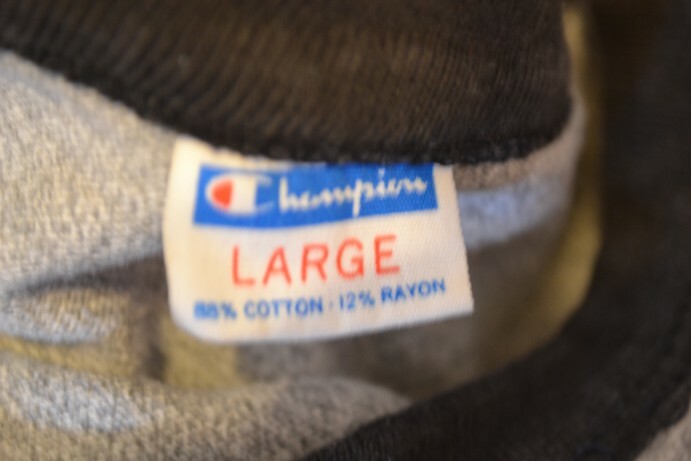 When thrifting, take time to search a size above what you normally wear. There may be pieces that fit quite well. When buying online, look for accurate measurements of length, shoulder width, and chest width (pit to pit). At once ubiquitous and unique, t-shirts are great gateway to the world of vintage clothing. They offer styles and stories and fits as various their owners. I’m hoping this guide can help you take the leap. If you want to learn more about the world of vintage t-shirt collecting, I recommend exploring the Defunkd Vintage T-Shirt Collective. There’s a lot of awesome, timeless content there. You can also check out the books Rap Tees or Vintage T-Shirts for some cool photos and history. But if you need further incentive, please know that the global t-shirt economy is one of the most wasteful and exploitative on Earth. 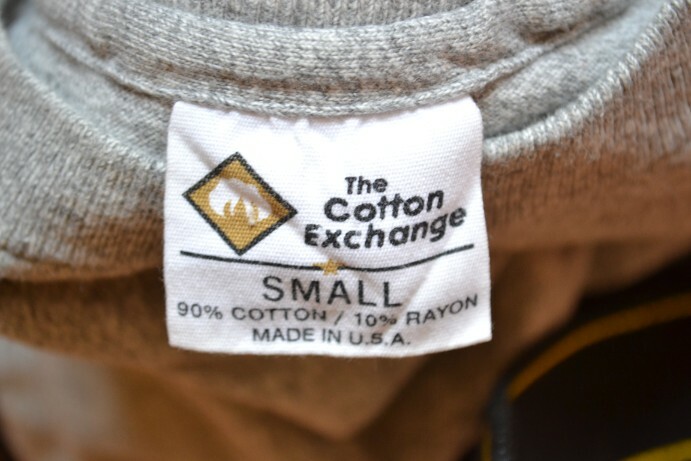 Buying used t-shirts helps, in a tiny but meaningful way, to counter emissions, improper chemical disposal, and human exploitation, not to mention the literal waste of discarded t-shirts. Good article. Thank you. One thing: you told us what a selvage pocket isn’t, but you didn’t tell us what it actually IS. This was interesting and very informative as well as helpful. Inspired me to revisit thrift stores and “treasure hunt..” Thank you! wow this is a pretty thought out article keep up the content bro!! Yeah been wanting to go hunt for some vintage adidas, tommy hillfiger and nike at goodwill !!! ill take your advice !! Hi.. Am looking for the timeline for anvil tag, especially the time period for tag with red bar and the one with black bar. Appreciate the info. Thanks. A lot of great info here. Especially the sizing. You never know the actual fit until you put it on.